In an eleventh hour action, a three member panel of the UK Supreme Court issued a temporary court-ordered reprieve in the case of a nine month old baby whose life support had been scheduled to be turned off at midnight Wednesday over his parents’ strenuous objections. The panel will announce whether they will take the case on June 8. Until then, life support cannot be removed from Charlie Gard. The drama centers around little Charlie, suffering from a rare mitochondrial depletion syndrome. His parents, Connie Yates and Chris Gard, have been prevented from removing him from the Great Ormond Street Hospital (GOSH) in London to take him to the United States for experimental treatment. In its coverage of the latest development, The Sun newspaper includes a video news clip that shows an American girl, ”Sara,” who was once immobilized with the same mitochondrial syndrome but is now riding a bike after one year of the nucleoside bypass treatment. A tremendous public outc ry in opposition to the hospital’s position is backed up with $1.5 million pledged on GoFundMe to pay for Charlie’s therapy and trip overseas. If permission is granted next Thursday by the Supreme Court, another date for a full hearing will be set. The delay in court rulings, while sparing Charlie from being unplugged from the respirator, has prevented him from starting the new therapy. The Kansas legislature is sending Gov. Sam Brownback another first-in-the-nation pro-life bill. This morning the state Senate approved, 25-15, Senate sub SB 83, an update to the 1997 Woman’s Right to Know statute, that the House passed Friday 84-38. “I think this is a bill that will help women make the right choice and an informed decision,” said Sen. Rob Olson (R-Olathe), who carried the bill today. The Disclose Act was introduced this session in both chambers with numerous pro-life co-sponsors, including the three practicing physicians who are state representatives. The bill carrier in the House was Rep. Susan Humphries (R-Wichita). The Disclose Act requires abortion businesses to provide –in an easily readable typeface –minimum professional information about each abortionist listed on clinics’ online informed consent documents. Kansas abortion clinics cannot defend not providing basic data about the pool of practitioners they list on the informed consent documents they all make available online. State law requires this consent document as the gateway form that must be downloaded and time-stamped at least 24 hours prior to the abortion. Currently if a woman uses the clinic’s form, she doesn’t “choose” the abortionist; she is assigned one. Nor can she evaluate if that practitioner is acceptable to her. She has no idea of the abortionist’s training, age, and professional reliability. This information stranglehold is not faced in any other elective procedure. disciplinary actions completed by the State Board of Healing Arts (which regulates physicians). Abortion clinics can very easily add this information in a one-time data entry to their online admission forms. Abortion clinics unjustifiably defend withholding this information–calling it harassment–the very words some abortion supporting Senators used today in debate. A hostile motion by Sen. Dinah Sykes (R- Lenexa) to send the bill back to committee– to extend the disclosures to other medical practitioners– failed 16-23. Sen. Pilcher-Cook also read some excerpts from the National Abortion Federation convention which indicated the coarseness of abortionists. “The nature of abortion is ugly and it’s evil because it kills a human being,” she said. The Disclose Act is a recognition that–unlike decades ago when the Woman’s Right to Know Act became law–the great majority of abortions in Kansas are currently secured with a phone call or internet contact, not an office visit or medical referral. printed it as to be barely-readable in tiny grey type on a tinted background. That is the reason for requiring baseline data about abortionists be printed in black ink, 12 pt. size, on white paper. A second court has now doomed 9-months-old Charlie Gard to die inside a London hospital. The UK Court of Appeal ruled this morning against the plea of parents Connie Yates and Chris Gard that they be allowed to take their failing son out of a British hospital for experimental treatment in the U.S. The decision by Justices Andrew McFarlane, Eleanor King and Philip Sales affirmed a lower court ruling of April 11 that the Great Ormond Street Hospital (GOSH) keep Charlie on the premises and remove him from a ventilator and feeding tube. Charlie entered GOSH in October and was diagnosed as suffering from a form of mitochondrial disease that causes progressive muscle weakness and brain damage. Subsequently, his parents discovered that 18 people in the United States had been treated with an oral medication of naturally occurring compounds to remedy this rare condition. Reports have not identified the doctor who initially agreed to treat Charlie, but it was noted that his parents were aware that no cure was promised. Over 80,000 people around the world agreed with that position and generously pledged over $1.5 million in a GoFundMe campaign (#Charliesfight) to get him out of the hospital and into the experimental therapy. One can only sadly wonder, alternatively, what Charlie’s “condition” would have been if GOSH had released him—months ago– for the new therapy. His parents never imagined that bringing their baby to a hospital meant they would lose the ability to remove him. But that is what British courts have now decreed. Three UK Court of Appeal judges heard arguments today in the case of releasing a baby boy on life support to get experimental therapy in the United States. Justices Andrew McFarlane, Eleanor King and Philip Sales are expected to issue a ruling Thursday in a case reviewing a decision against the baby’s parents made April 11 by High Court Justice Nicholas Francis. Imagine yourself in this drama, as the London parents, Connie Yates and Chris Gard. After their son Charlie was born healthy in August, they brought him to the Great Ormond Street Hospital [GOSH] for care in October. After establishing a diagnosis of a rare and incurable disease, GOSH then prevents them from taking their failing son overseas for a “last chance” experimental treatment! Parents stateside have watched a related development as Scott and Sheryl Crosier led a crusade to stop DNR orders from being placed on children without parental notice and consent. Their 3-months-old son, Simon, with Trisomy 18, was denied resuscitation and died. Multiple stories of medical bias against medically fragile children were presented to the Kansas legislature, which enacted Simon’s Law in April by resounding margins. Britain has no such hospital decision-making protection for parents. Over 80,000 members of the public responded generously to pledge over $1.5 million to cover Charlie’s expenses… yet GOSH will not let Charlie leave the premises! In essence, the hospital asserts the parents are unreasonable to pursue a treatment, cannot tell if they are causing Charlie pain and there’s no “meaningful” reason for Charlie to stay alive. It is now five months since the funding campaign was started by Charlie’s parents, desperate to get him to the U.S. to be involved in experimental “nucleoside bypass therapy.” They acknowledged it was a move that had limited scientific basis to repair Charlie’s mitochondrial depletion syndrome, but would assuredly aid in the research to help others in the future. It is hard not to see that Charlie Gard’s deteriorating condition is due in no small part to the stubbornness of a hospital unjustly asserting control, and “usurping the parental function” in the words of the parents’ attorney today in Court. The Court of Appeal will have the final word Thursday. The Disclose Act addresses the reality that 65% of Kansas abortions are “first-time” events, with the great majority of women knowing NOTHING about the procedure or the abortionist—much less his/her training, skill, or access to hospital facilities for a mishap. One clinic has had 100% turnover of their abortionist staff in 3 years; their current Kansas-resident practitioner agreed not to practice ob/gyn, under a State Board of Healing Arts disciplinary action. One clinic has recently hired a 76-year-old neurologist without ob/gyn formal training to do abortions. Kansans for Life has been told that, notwithstanding the state Board of Healing Arts’ “appreciating” our concerns for women, they will take no action for the above situations. Yet abortion attorney Bob Eye told House and Senate committees this year that the Board insures abortionists meet rigorous standards and women therefore need not be told any professional data about them! All Kansas abortion businesses have individualized “informed consent” documents required to be downloaded 24 hours prior to the woman’s trip to the abortion clinic. The great majority of women obtaining Kansas abortions will be in the facility only on the day of the abortion, and nearly half of them are residents of another state. undermining the requirement that each woman is giving consent to ONE specific practitioner –not a list of possibles. seven “bullet points” of information be given for each listed abortionist. Women contemplating elective abortion assume that Kansas regulators protect them from disqualified and/or untrained abortionists. Since that isn’t the case, women deserve passage of the Disclose Act. On Thursday afternoon, the Disclose Act became part of a “conference committee report” process headed for votes in both chambers over the next few days. Today, it was confirmed in the British press that the U.K. Court of Appeal will review on May 23, the case of Charlie Gard– a nine-months-old baby ordered off life support by the High Court last month. Baby Charlie has been in a London hospital since October, when it was detected he had mitochondrial depletion syndrome, a rare and grave chromosomal condition that weakens his muscles. No successful cure is yet available, but he is eligible to receive an innovative treatment in the U.S. called nucleoside bypass therapy. London’s Great Ormond Street Hospital, however, won’t allow Charlie’s parents, Connie Yates and Chris Gard, to remove him for the trip overseas– even after more than $1.5 million has been raised with a GoFundMe campaign, to cover medical expenses and travel. But the modern definition of dignity is too often infected with subjective “quality of life” assessments and rationed care considerations. The attorney for Charlie’s appeal is Charles Da Silva, and the granting of this appellate review reflects a legal analysis that the parents can possibly prevail. The huge outpouring of support from the public is quite touching, including candlelight vigils, and letters storming Parliament as registered on social media at #charlie’s fight and www.charliesfight.org. The public believes Charlie’s parents should be in charge of their son… will the Court of Appeal see it that way? Abortion promoters are trying to steer the public away from the absolutely irrefutable scientific fact that each abortion destroys a tiny unborn living member of the human family. That’s the science that matters—and it is demonstrated in every sonogram. As they have regularly done in the past, Guttmacher misstates Kansas law. Kansans for Life has repeatedly reported errors, with documentation, to no avail. 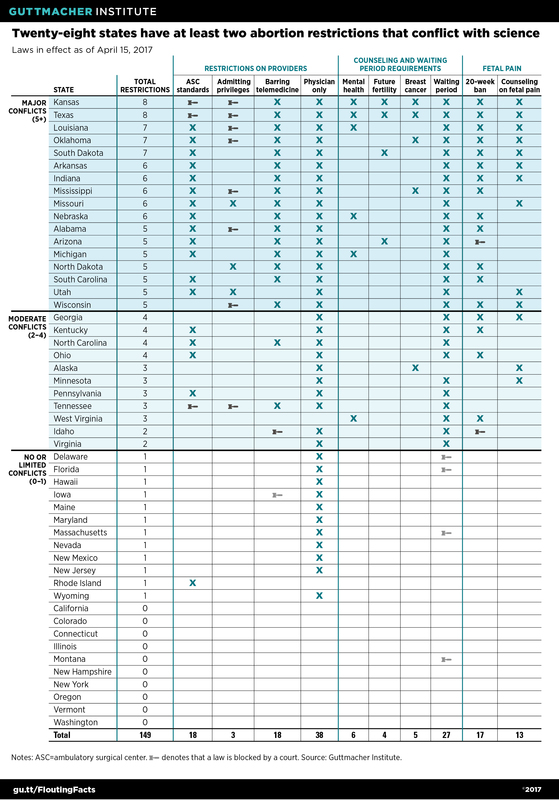 In the state comparison chart, Guttmacher asserts that only two Kansas “provider” provisions are being litigated. However, all four “provider” provisions are part of the 2011 Abortion Clinic Licensure Act, enjoined and not in effect due to litigation stalled in the court of Judge Franklin Theis since June of 2011. The PR problem the abortion industry faces is the increased pro-life convictions of the voting public, which has strongly elected pro-life legislators, the majority of all sitting governors and the new Trump administration. Kansans have overwhelmingly supported the laws Kansas has passed. We cringe at our past history as the late-term abortion capital of the nation. It would be a travesty for the Kansas State Supreme Court to believe otherwise as they prepare to issue a ruling on whether our pre-Civil War Constitution contains a right to abortion broader than that created by Roe to Wade.